SINGAPORE - The National University of Singapore (NUS) gave out awards to 19 of its alumni on Thursday for their contributions to their alma mater and society. 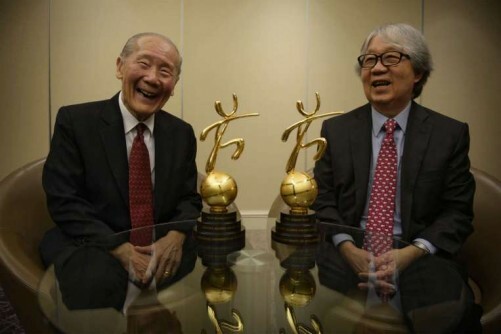 At the sixth edition of the biennial NUS Alumni Awards, the highest honours were conferred upon Ambassador-at-Large Professor Tommy Koh and internationally-renowned historian Professor Wang Gungwu. During the ceremony at the Marina Mandarin Hotel, NUS president Professor Tan Chorh Chuan said: "The award recipients are outstanding individuals who have demonstrated visionary leadership in their respective fields, and contributed with passion and dedication to the university and society. "NUS is proud to have these individuals among our distinguished alumni. Collectively, they inspire us to continue to strive for excellence and contribute our best to the community." Prof Wang, one of the two Eminent Alumni Award recipients, is considered a leading authority on Chinese history, particularly for his distinctive interpretation of Nanyang Chinese history, the Nanhai trade and the relationship between the Ming Dynasty and Southeast Asia. At NUS, the 85-year-old is currently chairman of the Lee Kuan Yew School of Public Policy's governing board, and of the East Asian Institute. In 2007, he became the third person to receive the title of University Professor from NUS, the institution's highest academic achievement. He is the author of numerous books and articles, many of which have been translated into various languages. Prof Wang said the awards demonstrated how keen the university was to maintain close relations with its alumni. "The alumni of every university is an important part of contributing to society. The university has to deliver by producing graduates who serve society, who are competent and capable of new ideas, to deal with a rapidly changing world." He added: "I entered university as an undergraduate at age 17, and I have never really left. You could say my loyalty to the university has been absolute." Prof Koh, a lawyer and diplomat, was presented with the Eminent Alumni Award for his contributions to Singapore's foreign policy and NUS's law faculty, as well as his support of the local arts, heritage and environment. The 78-year-old has been Singapore's Ambassador-at-Large at the Ministry of Foreign Affairs since 1990, and served at NUS for 53 years. He was formerly Singapore's Permanent Representative to the United Nations (UN) from 1968 to 1971, as well as NUS law dean. Prof Tan described him as "a Renaissance man - a multi-dimensional, multi-talented person", whose "impact and profile are truly global". At the ceremony, seven alumni, including NUS senior fellow in economics Dr Lee Soo Ann and IBM Asia-Pacific vice-president Janet Ang, received Distinguished Alumni Service Awards for their services to the university. Ms Ang, 56, said she was "very humbled" by the award. "I stand on the shoulders of giants," she said of her fellow recipients, including Dr Lee, who had been her lecturer in NUS. NUS also lauded 10 young alumni aged 40 and below, such as national shooter Jasmine Ser, fashion designer Priscilla Shunmugam, and Ang Mo Kio MP Dr Intan Azura Mokhtar, with the Outstanding Young Alumni Award.